If CO2 emissions continue on current trends, this could result in the average pH of the surface oceans decreasing by 0.5 units below the level in pre-industrial times, by 2100. This is beyond the range of natural variability and represents a level probably not experienced for at least hundreds of thousands of years and possibly much longer (Caldeira & Wickett 2003). Critically, the rate of change is also at least 100 times higher than the maximum rate observed during this time period. These changes are so rapid that they will significantly reduce the buffering capacity of the natural processes that have moderated changes in ocean chemistry over most of geological time. Pteropods, or “sea butterflies,” are eaten by a variety of marine species ranging from tiny krill to salmon to whales. The photos show what happens to a pteropod's shell in seawater that is too acidic. On the left is a shell from a live pteropod from a region in the Southern Ocean where acidity is not too high. The shell on the right is from a pteropod in a region where the water is more acidic. (Figure source: (left) Bednaršek et al. 2012e (right) Nina Bednaršek). Table 1. Changes to ocean chemistry and pH estimated using the OCMIP3 models calculated from surface ocean measurements and our understanding of ocean chemistry. Note that the concentration of bicarbonate ion (HCO3 – ) and carbonic acid (H2CO3) increase with rising atmospheric concentration of CO2 while carbonate ion (CO3 2–) decreases. 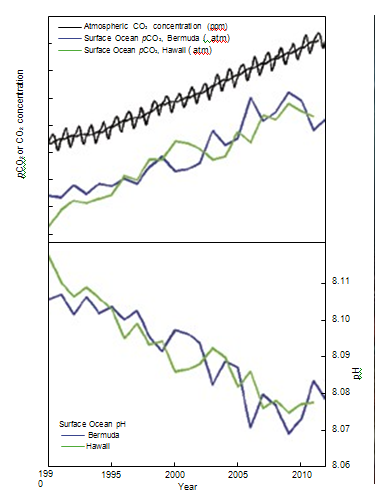 The average pH of the surface ocean waters decreases with increasing atmospheric CO2 concentration. (Assumptions used in model: Total alkalinity = 2324 mol/kg, temperature = 18° C. All other assumptions as per OCMIP3 (Institut Pierre Simon Laplace 2005). Aragonite and calcite saturation calculated as per Mucci & Morse (1990). Physical oceanographic modelling is based on Bryan (1969) and Cox (1984). 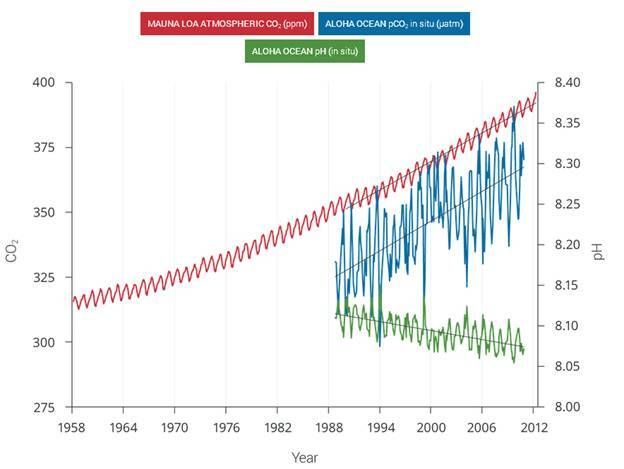 If CO2 emissions continue on current trends, this could result in the average pH of the surface oceans decreasing by 0.5 units below the level in pre-industrial times, by 2100. This is beyond the range of natural variability and represents a level probably not experienced for at least hundreds of thousands of years and possibly much longer (Caldeira & Wickett 2003). Critically, the rate of change is also at least 100 times higher than the maximum rate observed during this time period. These changes are so rapid that they will significantly reduce the buffering capacity of the natural processes that have moderated changes in ocean chemistry over most of geological time.